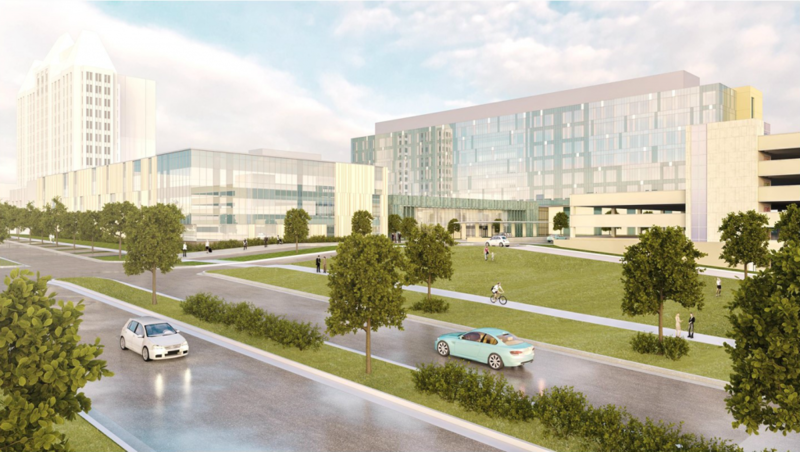 Today SSM Health released new renderings of its new $550M hospital and ambulatory care center on 15 acres along South Grand Boulevard. 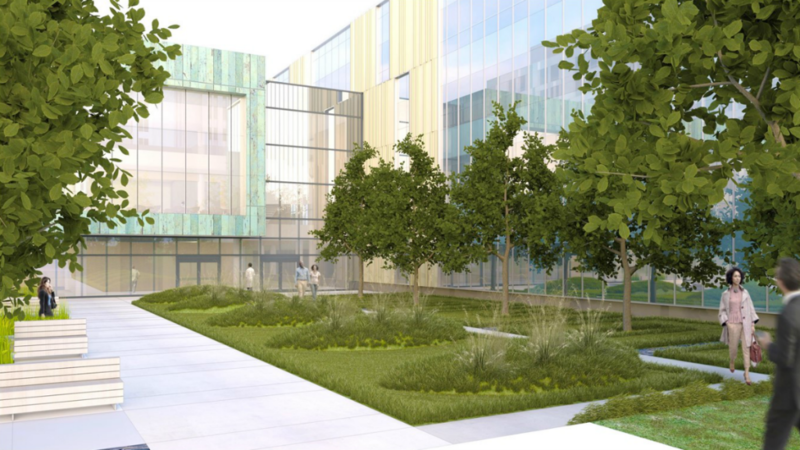 The project features 800,000 square feet of space, 316 patient rooms, expanded trauma center and emergency department, larger intensive care units, more parking, green space, and areas for any future campus expansion. 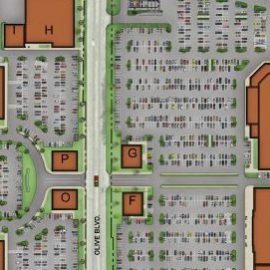 That last item seems to pertain most directly to the prominent northeast corner of the site where previous renderings have shown a parking garage with street-level retail built up to Grand. Now, instead of two parking garages, the western garage has grown, and a grass lot occupies what will be the corner of Grand and the future Lasalle Street. According to SSM, the project total more than 2.2 million workforce construction hours and a peak workforce team of more than 600. Groundbreaking for the project is planned for August of this year, with completion in 2020. SSM Health is a Catholic, not-for-profit health system serving the comprehensive health needs of communities across the Midwest. SSM Health Saint Louis University Hospital is a 356-bed quaternary and tertiary hospital specializing in organ transplants and home of the Mid-America Stroke Network. 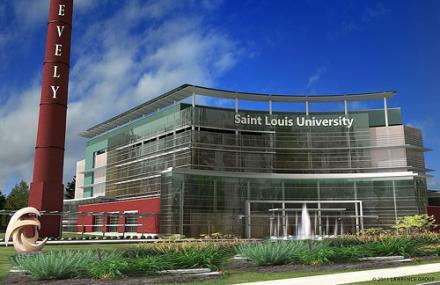 A teaching hospital, SSM Health Saint Louis University Hospital is home to SLUCare physicians and students of Saint Louis University Medical School. SLUCare Physician Group is the academic medical practice of Saint Louis University, with more than 500 health care providers and 1,200 staff members in hospitals and medical offices throughout the St. Louis region. SLUCare physicians are trained in more than 50 specialty fields. 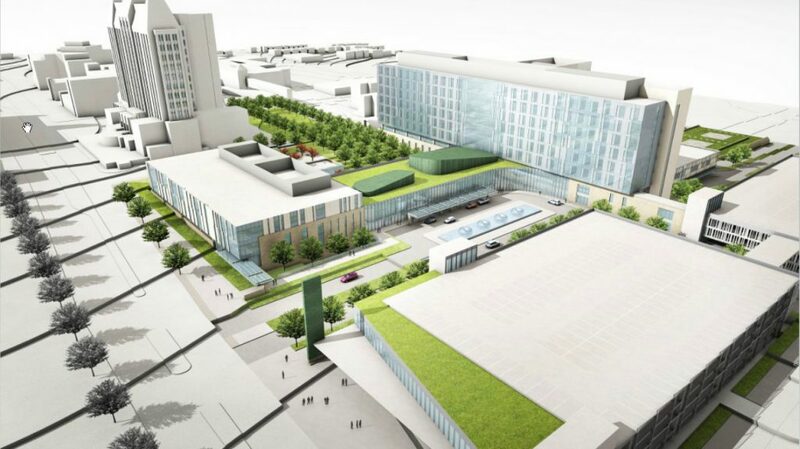 nextSTL has reported on the $550M SSM/SLU Hospital development since summer 2015. Slowly, details of the remade medical facility have been revealed and it now appears we know what the hospital is likely to look like. 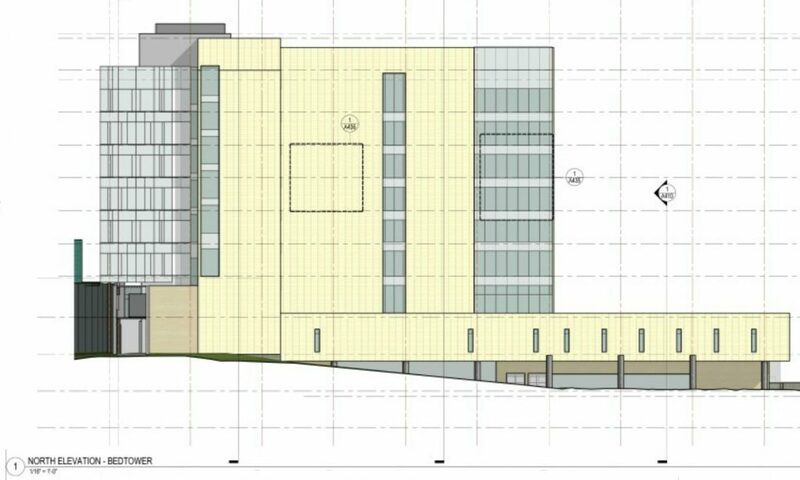 The massing plans previously shared mirror the new images, which include significantly more design detail. 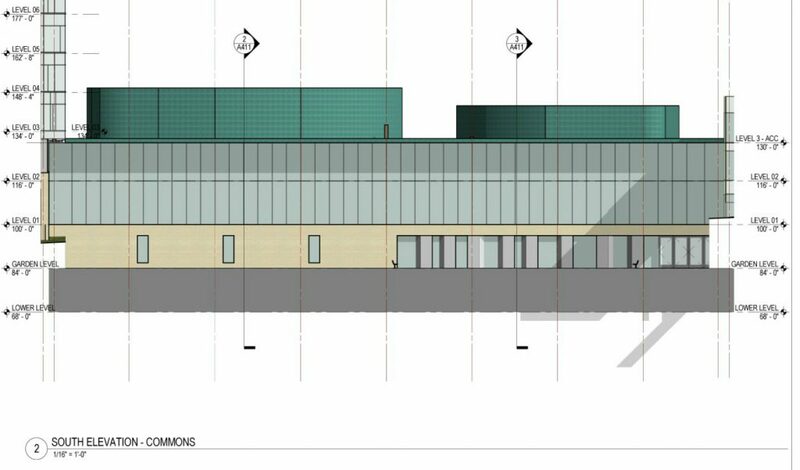 It appears building facades will feature the varied-width glass panel design that has quickly become popular with institutional buildings, including the second phase of the St. Louis College of Pharmacy project, and the BJC @ The Commons building. 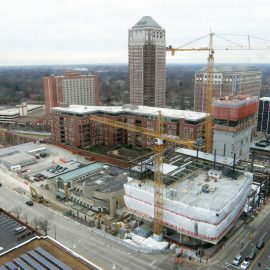 The new tower, rising nine stories, is set back significantly from Grand Boulevard, where a three-story ambulatory care center will connect with the tower via a Commons, which will serve as the main entrance to the facility. Two parking garages will front what will be a new Lasalle Street running east-west. Access to the facility will be from Grand and Lasalle. 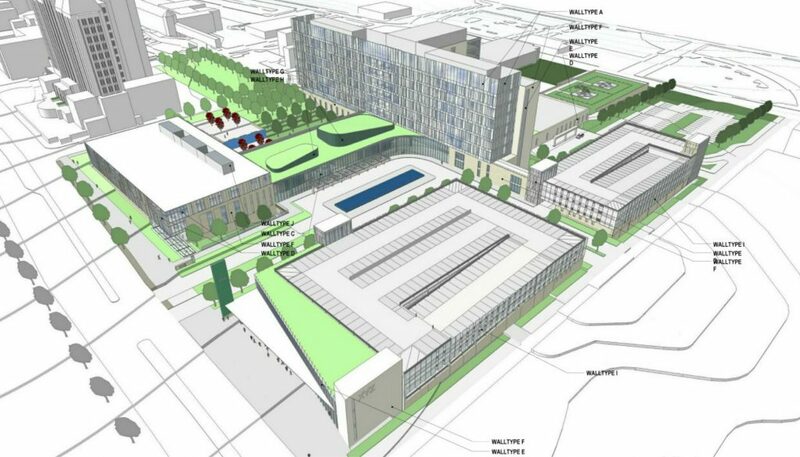 While significantly more detail is revealed, nothing new is offered regarding the future of three prominent buildings within the project site. It is a near sure bet that the historic Desloge Tower remains, though its future use has not been determined. 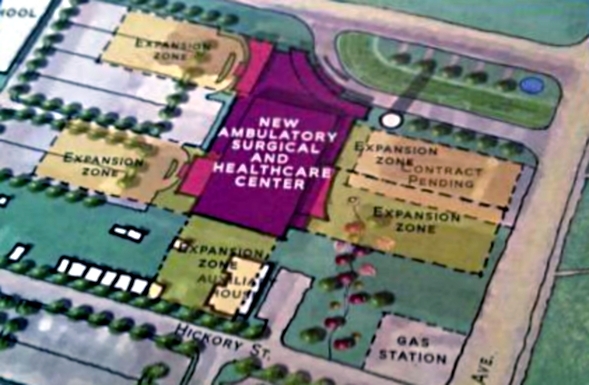 The existing attached hospital building will be demolished. 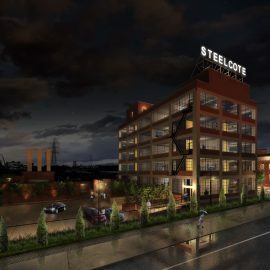 At the north end of the site, it’s a good bet that the Missouri Belting and Pevely buildings will be demolished. 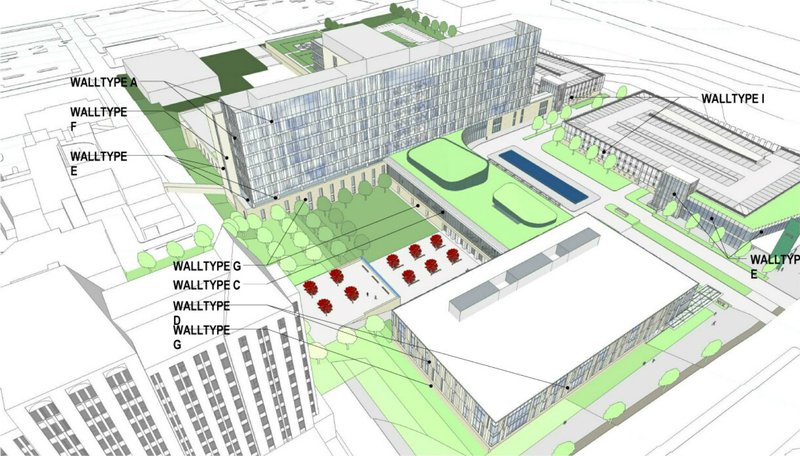 The City of St. Louis recently gave a development corporation led by Saint Louis University rights to control development across 395 acres spanning the school’s medical and Frost campuses. 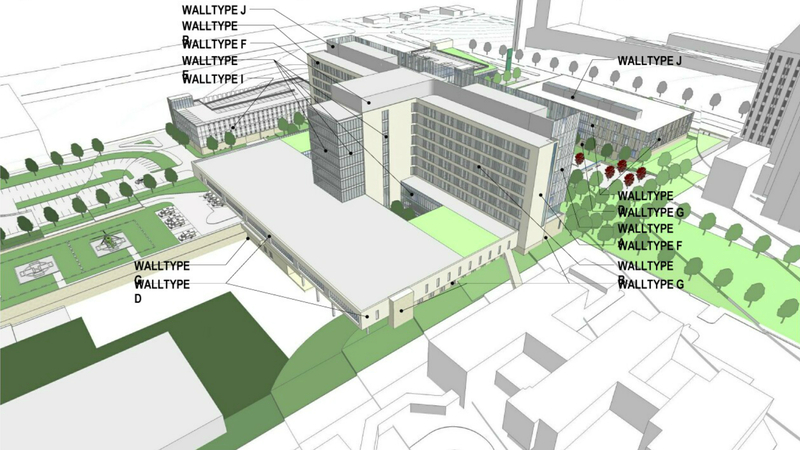 The move empowers the university to have the final say on development within the site, grant tax credits to projects, deny others, and bypass any demolition review. In the recent past, both the Missouri Belting and Pevely buildings have been saved from demolition by the city’s Cultural Resources Office and Preservation Board. 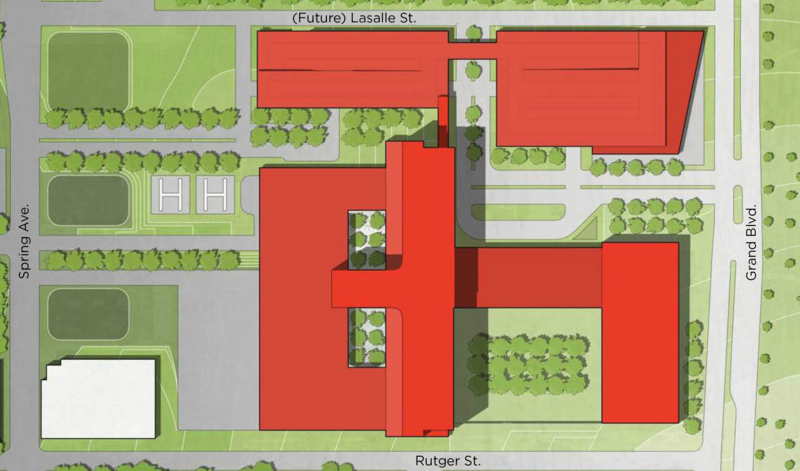 In a message to faculty, staff, and students today, Saint Louis University President Fred Pestello unveiled additional details, including a site plan for the SLU/SSM $550M academic medical center. 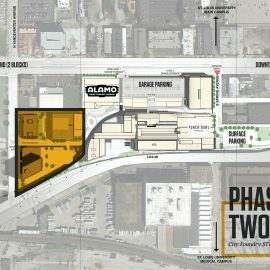 The massive project was first reported on nextSTL last June. 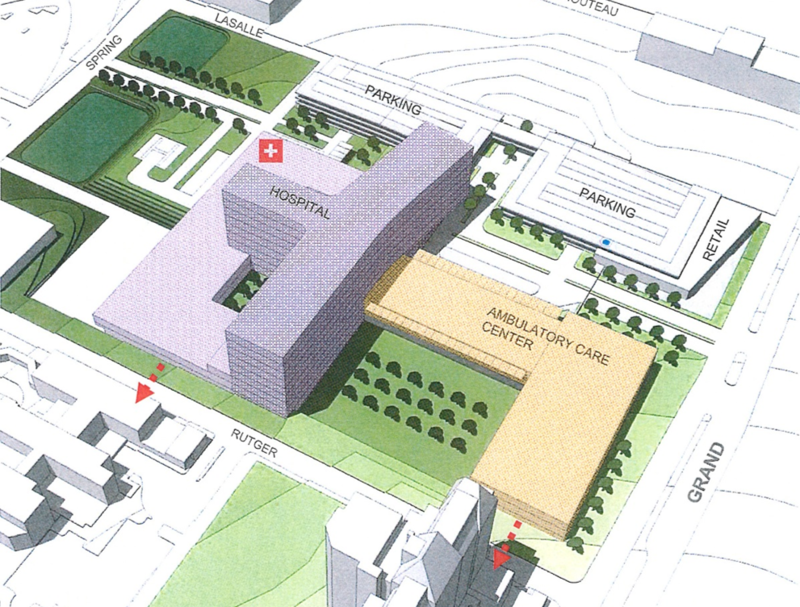 As previously reported, the project will be built immediately north of Desloge Tower and the existing hospital. The fate of Desloge Tower has still not been determined. 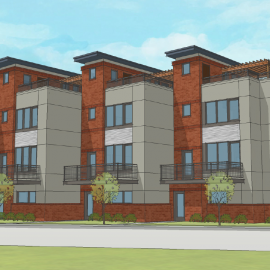 Pestello shared that the 316-bed, 802K sf project has completed the general scope and conceptual design stage and that specifics continued to be determined. 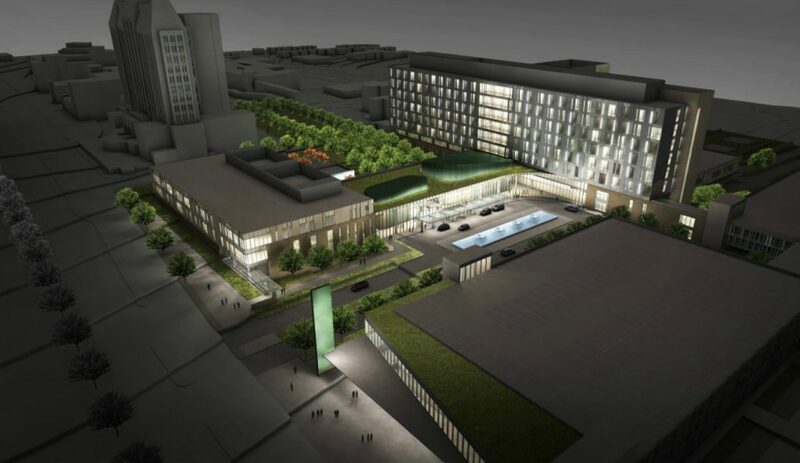 He also stated that the project “furthers the progress of the SLU campus master planning initiative, which includes redevelopment of SLU-owned property to the north of these new SSM facilities.” The project is scheduled to be completed by late 2020. Last year, Saint Louis University purchased the hospital from Tenet Healthcare, which has owned the facility since 1998, when it was purchased from the school. SLU then contribute the hospital to SSM in exchange for a minority membership interest. That deal became official September 1, 2016, allowing for planning on this project to proceed. 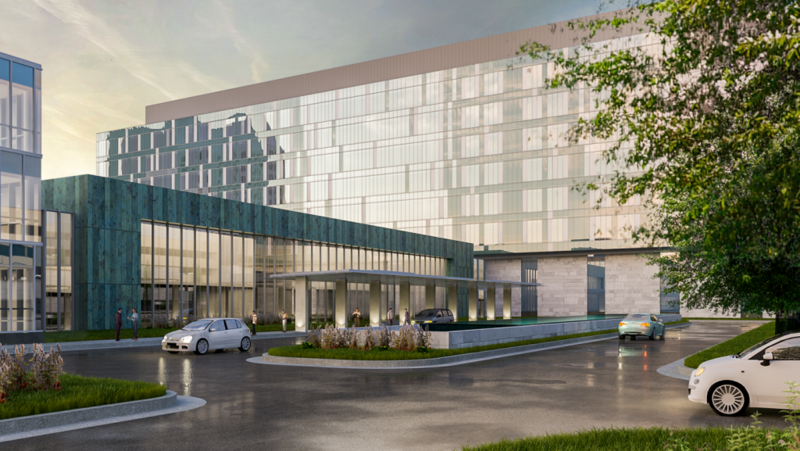 Selected to design the project were The Lawrence Group in partnership with Hammel, Green and Abrahamson (HGA).